Nankana town is part of Nankana Sahib District in the Punjab province of Pakistan. The Nankana Sahib district is adjacent to the Sheikhupura district and until 2005 was part of the Sheikhupura district. The old name of town was Talvandi Rai Bhoe Ki or 'Talvandi of Rai Bhoe', a muslim rajput of the Bhatti clan and a retainer of the Delhi rulers of the early fifteenth century. His descendant, Rai Bular, the chief of Talvandi, was a contemporary of Guru Nanak. The town marks the birth place of Sri Guru Nanak Sahib Ji (Gurdwara Sri Nankana Sahib). Rai Bular renamed Talvandi Rai Bhoe Ki as 'Nankana Sahib' after the birth of Guru Nanak (1469-1539), the founder of the Sikh faith. 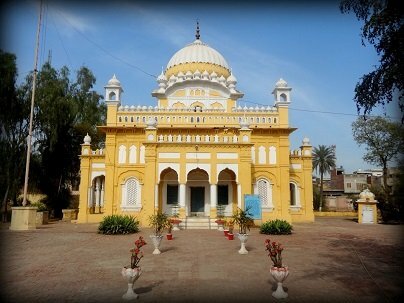 There are 9 Historic Sikh Gurdwaras in Nankana Sahib. Gurdwara Sri Nankana Sahib, also known as Gurdwara Janam Asthan, is the Gurdwara representing the home of Mehta Kalyan Das (also known as Metha Kalu) and Mata Tripta, who were the parents of Guru Nanak. This was where Guru Nanak was born. A room was first built here by Guru Nanak's son, Baba Lakhmi Das, but it was more probably constructed by Guru Nanak's grandson, Baba Dharam Chand (1523-1618). The one room structure was known as 'Kalu ka Kotha', literally 'house of (Mehta) Kalu'. Later it came to be known as 'Nanakayan', literally 'home of (Guru) Nanak'. The Gurdwara was established before the end of the 16th century because Guru Arjan(1563-1606) is believed to have visited it. Guru Nanak was born in 1469 in a small village named Talwandi. 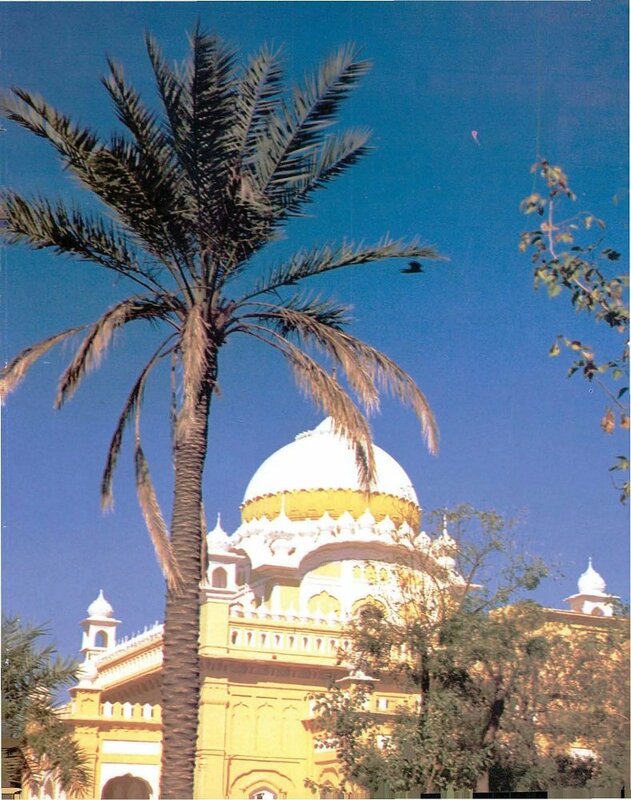 The village is now called Nankana Sahib after the Guru and is now in Pakistan. Nankana means Nanak's village. When Guru Nanak was nine years old, his father was determined to make him wear a janeu (sacrificial thread of the hindus). The Guru said, "Please wait. Let me first try to understand why you want to put this thread around my neck." Guru Nanak's parents were worried and called a doctor to see if he was sick. Maharaja Ranjit Singh (1780-1839), at the insistence of Akali Phoola Singh and Baba Sahib Singh Bedi, constructed the present building, a domed square sanctum with a pavilion in front standing on a spacious, raised platform, and made an endowment of about 18,750 acres of land for the maintenance of the Guru ka Langar. Pakistan's muslim run WAQF board seized control of Sikh Gurdwaras in Pakistan, their lands and revenues. Sikh are barred from visiting many Gurdwaras in Pakistan. About 300 metres from Gurdwara Sri Nankana Sahib, Gurdwara Sri Bal Lila Sahib was originally built by Rai Bular, the ruler of the village. It is significant as the village playground, where young Nanak assembled his friends not only for physical games but to lead them as holy man sitting in meditation. Gurdwara Sri Bal Lila Sahib marks the field where Guru Nanak used to play in the company of other children. As is apparent from the name, this site is related with the wonderful adventure of the early childhood of the Guru. The Guru in his infancy, used to transport the enlightenment of the Naam (God's name) to the minds of his friends, while playing with them. The original holy pond Nanaksar with this Gurdwara was built by Rai Bular, the ruler of Talwandi. Sri Guru Hargobind Sahib during his visit to the town is said to have enlarged the site. Diwan Kaura Mall, a hindu noble (d. 1752), after his victory over Multan with the assistance of the Sikhs in 1748, further enlarged this Gurdwara and brick lined two sides of the nearby tank originally dug by Rai Bular. During the early 1800s, Maharaja Ranjit Singh had the building renovated and the tank enlarged and properly lined. Of the land donated by him, about 3,000 acres were allotted to Gurdwara Sri Bal Lila Sahib. After the 1921 tragedy at Gurdwara Sri Nankana Sahib, the custodian mahants of this Gurdwara voluntarily handed it over to the Shiromani Gurdwara Parbandhak Committee in exchange for suitable maintenance allowance for their families. Guru Nanak was not an ordinary child. Children of his age liked him very much and everyone wanted to play with him. Before the Saka of 1921, the arrangement of this Gurdwara was in the hands of the Nirmala Singhs. Besides Tirath Singh, the Mahant there were also 37 other patidaars. 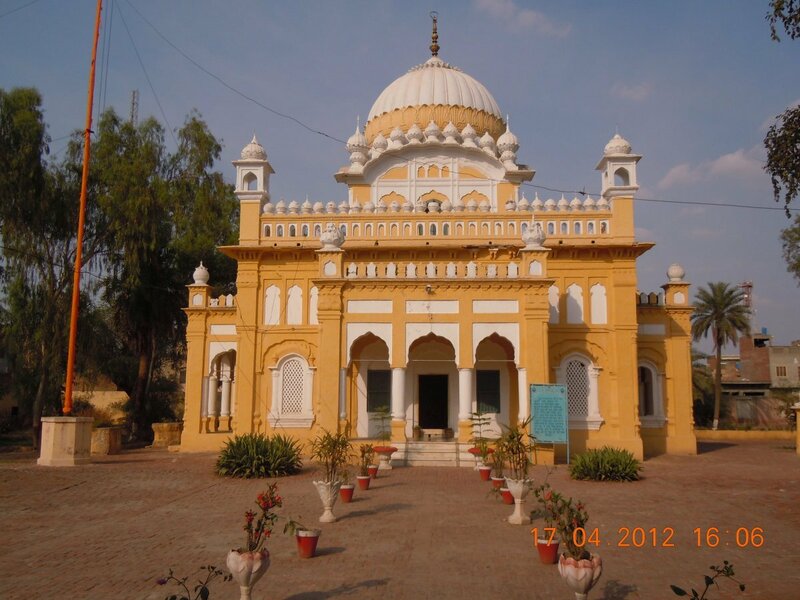 The Gurdwara came under the panthic management at the time of the Gurdwara Sudhar Movement. This Gurdwara remained in the panthic hands up to 1947, but after the partition, the Pakistan Waqf Board has been serving the Gurdwara. The sarovar adjacent to the Gurdwara is lying dried up and the Gurdwara is opened only at the time of visiting to it by the Sikhs. There is no arrangement of Parkash of Guru Granth Sahib. It is only the building which is safe and sound. The present Gurdwara was reconstructed during the 1930's and 1940's under the supervision of Sant Gurmukh Singh Seva wale (1849-1947). The new building on the bank of the adjoining sarovar was a multistoreyed domed edifice. However, it seems this has now also been rebuilt. As a young child Guru Nanak Sahib Ji first studied Punjabi with Pandit Gopal, then Sanskrit with Pandit Brij Lal and at 13 years of age he mastered Persian studying with Maulvi Kutab Ud Din. Hence Patti Sahib is also known as Gurdwara Maulvi Patti Sahib. Gurdwara Patti Sahib also called Gurdwara Maulvi Patti Likhi ('Patti' means a wooden board on which children learn to write alphabets with a pen made of a soft stem. The board could be washed after the lesson and would be given another coating of soft light clay and is re-used) is located at the site where young Guru Nanak learned the various different languages mainly Persian and Arabic which were then used in the Punjab, each with its own distinct alphabet. The divine wisdom and spiritual enlightment evident in the young Nanak became well known in his village when at the age of seven he astonished his teacher Pandit Gopal with his eloquence in explaining deeper truths about man and God and even composed an ancrostic on the Punjabi alphabet giving a divinely inspired interpretation to each letter. Guru Nanak always spoke and sang of one God and his love for God and being rich in music and melody he cast an irresistible spell on all those who listened to him. At the age of five, Guru Nanak was sent to school, which was run by teacher, Pandit Gopal Das, at his village. Guru Nanak appears to have continued to attend school for some time. One day he was observed to remain silent, and not apply himself to his books. The village tutor asked him why he wasn't reading. Deeply impressed by the profound and convincing thoughts of Guru Nanak, Gopal met Mehta Kalu and advised him to send his son to a learned scholar. Guru Nanak while criticising the then prevalent methods of education, which of course meant no education for some, (particularly women and the lower castes) enlightened his teachers to the actual purpose of learning which gave a new meaning to each and every word. The Maulvis and the Pandits were quite ignorant of his new, revolutionary mode of teaching. 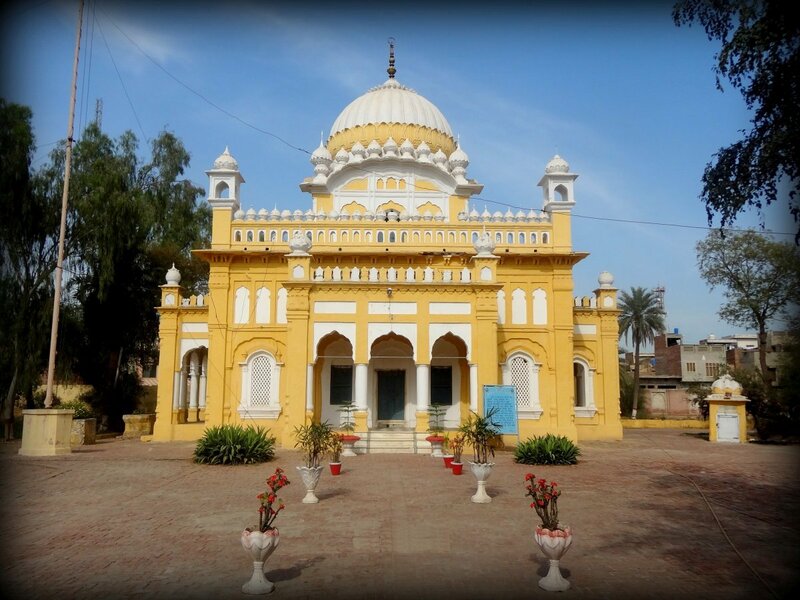 This sacred Gurdwara lies midway between Gurdwara Janam Asthan and Gurdwara Bal Lila along the road leading from Janam Asthan to the railway station in Nankana Sahib. About two kilometres to the east of Gurdwara Sri Bal Lila Sahib, commemorates an event connected with the early years of Guru Nanak. While tending his father's herd of cattle, it was common for him to let the animals roam freely while he himself sat engrossed in meditation. Once a peasant complained to Rai Bular that Nanak's cattle had damaged the crop in his field, but when the field was inspected, no damage was discovered. Guru Nanak's father let him graze cattle but they went into a farmers field and ate the crops that were there. The people considered it a miracle and that particular field came to be reverently called Kiara (lit. field or plot) Sahib. A Gurdwara was raised here which was reconstructed by Sant Gurmukh Singh Sevavale during the decade preceding the partition of 1947. The new building comprises a square, domed sanctum and a circumambulatory verandah built on a raised plinth. This Gurdwara stands about one and a half kilometres east of Gurdwara Janam Asthan. The Janam Sakhis mention how Guru Nanak was one day sleeping on the ground under a Mal tree. Mal (also called jal and van) is a shady tree. It is said that once, in the afternoon, as Rai Bular and his men were riding among the fields in this area they noticed that while all shadows had lengthened and shifted eastward, the shade of that particular tree stood still over the sleeping Nanak. The king cobra is the world's longest venomous snake. Rai Bullar spotted the head of a large cobra showing above the tall grass with its hood spread wide open near Guru Nanak. The Bala Janam Sakhi has a slightly different version saying that as the shadow of the tree shifted, a cobra was seen spreading its hood over Guru Nanak's face protecting it from the sun. Rai Bular, impressed by the miracle bacame a Sikh. The Gurdwara on this site was first built by Diwan Kaura Mall and renovated during the time of Maharaja Ranjit Singh. It is larger and more imposing than Kiara Sahib with its broad copings mounted with domelets around the central dome, domed kiosks at the corners of the roof and porches on the sides of the hall. The interior of the gurdwara is decorated with ancient ceramic tiles, about four inches square, each depicting a cobra. Once Guru Nanak's father, Mehta Kalu, gave him some money and sent him to Chuharkana, a market town, to do business. Instead, Guru Nanak had fed hungry villagers with a sum of Rs. 20 /- obtained from his father and came back fully satisfied with what he had done. Only as he neared Talvandi, did he realise the possibility of his father's displeasure and rebuke. Hesitant to face his father's ire, Guru Nanak hid himself under a large van tree whose branches touched the ground making it look like a Tambu (tent) until discovered and taken home. At the age of eighteen, Guru Nanak, was sent by his father Mehta Kalu to the city to do business. 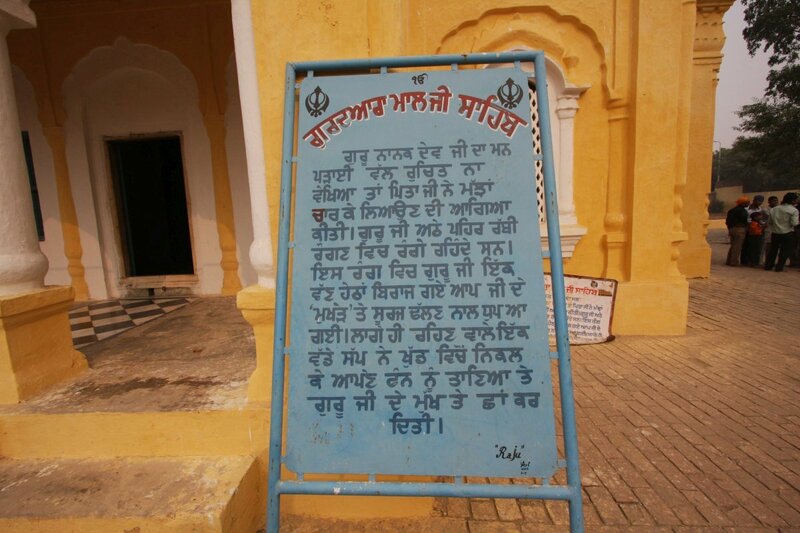 A Gurdwara was established near the tree, about a furlong east of Janam Asthan, during the Sikh Rule in Punjab. Its present building comprises a double-storey domed sanctum in the middle of a square hall which has architectural embellishments similar to those of Gurudwara Mal Ji Sahib but lacks the porches covering its front doors. There are 2 Gurdwaras here, Gurdwara Sri Guru Arjan Ate Guru Hargobind Sahib is located near Tambu Sahib on the road leading towards Janam Asthan Nankana Sahib. The Gurdwara of Sat Gur Arjan Sahib Ji is without a dome whereas the sacred Gurdwara of the Patshah of Miri Piri Guru Hargobind has been built with a dome. Both Gurdwaras share a common boundary wall. Guru Hargobind visited Nankana Sahib in the month of Har Samvat 1670 (1613 AD) while returning from Kashmir. The Guru's Sikhs established this Gurdwara at the site where he stayed. 13 ghumaon of land is said to be endowed to the Gurdwara. The tree under which Guru Sahib Ji stayed, has withered away. A piece of that tree has been preserved in a glass case and placed inside the dome of Guru Hargobind's Gurdwara so that the visiting Sangats may see it. Prakash of Guru Granth Sahib does not take place, only the buildings stand which Sikhs visit to get solace. This Gurdwara is situated in between Gurdwara Sri Tambu Sahib and Gurdwara Sri Hargobind Sahib. Gurdwara Sri Tambu Sahib was under the control of Nihang Sikhs. Mahant Bhai Sharam Singh had taken over the task of serving Guru Granth Sahib at the behest of Gurdwara Parbandhak Committee whereas Nihang Ujagar Singh, opposed this and established a separate Prakashasthan near Gurdwara Sri Tambu Sahib. The Prakashasthan established by Nihang Sikh, known as Nihang Singh Chaoni (camp), became known as Gurdwara Nihang Singhan and is still standing beside the Gurdwara Sri Tambu Sahib. Prakash is not held on both the places now. No land endowment stands in the name of Gurdwara. During the Akali movement, on 20th February 1921, Narain Das, the corrupt udasi mahant (clergy) of the Gurdwara at Nankana Sahib, ordered his men to fire on Akali protesters, leading to the Nankana massacre. The firing was widely condemned, and an agitation was launched until the control of the historic Janam Asthan Gurdwara was restored to the Sikhs. 1921 Nankana Massacre - The total number of Sikhs killed has been variously estimated between 82 and 156.